An individual (blind, physically weak and financially challenged) complained about the (lustful) attraction towards women and young men that was driving him crazy. He elaborated that this engrossment is to the extent that I am negligent of food consumption. I pray but sometimes I’m unaware of what was recited in prayers. I am very much afraid of this condition. I request a remedy for it. There are two levels of being attracted towards something. One is mere attention towards it and the second is love that is attention accompanied with a desire. The first level is a natural thing. Allah has placed (sexual) attraction in men (for women). It can neither be eliminated by any means nor it is required from us to do so. The second level is within one’s control (ikhteyar). It means that one has control to some extent in keeping it or annihilating it. An individual can increase his involvement in a thing to such an extent that that he is engrossed in it completely all the time. On the other hand he can avoid a thing to the extent that he no more desires it. Hence being volitional it is binding (to be acquired). First treatment is use of determination (himmat). Allah has placed the performance of volitional acts on the determination of an individual. He has promised assistance after determination. The second treatment is diverting thoughts. The attention has to be diverted away when there are overwhelming thoughts (of this nature). It is an axiom that lower-self (nafs) can not be attentive towards two things at one time. Therefore, at times of excessive desires be busy with something else. This may be religious activity like offering prayers, making remembrance or reciting Holy Quran, or it may be worldly activity like visiting someone, etc, etc.. The third treatment is to ignore these overwhelming desires completely. This is with the understanding that these feelings are not going to harm me at all. This is the most effective treatment. The individual said that how was it possible to ignore these thoughts. They have spoiled my prayers, dhikr and shugul. Not for a moment these thoughts leave me. These thoughts are from the first level. They are not sinful. You are responsible for your actions. You are responsible for implementing these thoughts into action. Until then it is neither sinful nor are you accountable for them. These thoughts are not going to harm you even if they continue for your whole life. The fourth treatment is to make supplication. The individual requested for some special prayer formula recitation (wazdhifa) to ward away this calamity. Wazdhifa can not do this. The treatment is as mentioned above. Instead to wazdhifa make supplications (dua). (In summary) use your determination, become busy in something else, cry and make heartfelt supplications showing extreme neediness that O Allah! Save me from these calamities. 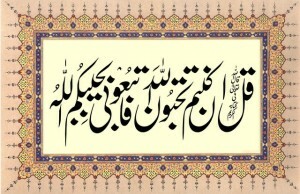 Indeed supplication is effective and leads to facilitation in difficulties. This entry was posted in C. Blame worthy Morals, E. States, F. Zikir & fikr, H. Whispering & random thoughts, N. Advice, T. Tarbiyet, W. Wird & wazaif, Z. Mustahebbat on May 21, 2013 by 'abd.